As of February 21st 2018, the ATLAS project is 100% Mapped. Translation = we have identified every high school with an athletics program in the United States (including the District of Columbia) and whether or not the student-athletes have access to an athletic trainer (AT). We have identified 20,443 high schools, those being public, private, magnet, alternative and special education schools. Within these high schools we have identified a total of , working either full or part time and providing care for the student-athletes during treatments and rehabilitation programs, practices and game competition. A mission of KSI is to promote the athletic training profession as well as increase the number of ATs and appropriate health care provided to the athletes across all levels of sport. Our ATLAS data has determined that 66% (n = 13,492) of schools with athletic programs have access to an AT in some capacity. The National Athletic Trainers’ Association District 2 (DE, NY, NJ, PA), has the highest percentage of ATs, providing 57% of full-time coverage and 25% part-time. The ATLAS survey began in June 2015 and we currently have a 49% completion rate. Surveys have been completed by secondary school athletic trainers throughout the country. The ATLAS project is a thirteen-person staff, consisting of 1 KSI faculty member, Dr. Robert Huggins, 2 Masters’ students: Brad Andres and Sarah Attanasio as well as ten undergraduate students volunteering their time to KSI and the project. Stress and subsequent fatigue are a normal part of sport and life and often desired in order to augment adaption to training. The concept of periodization, being the organization of training stress and recovery, is usually on the forefront of performance and medical practitioner’s minds. 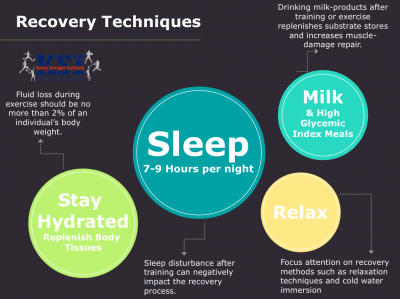 When training and physical stress is balanced with adequate rest and recovery, acute fatigue is often diminished in a matter of hours or days. However, if the body is not allowed to return to a balanced state (homeostasis) before excess stresses are introduced, maladaptation occurs. 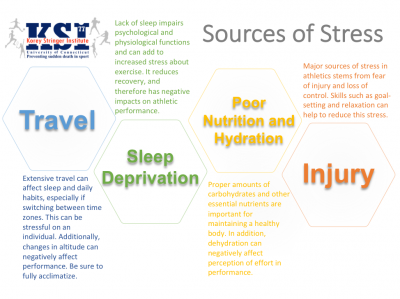 In optimizing performance for sport or life, it’s important to note that not all stresses are desired or accounted for.In the midst of a hectic season or normal life demands, it’s easy to forget to acknowledge and appropriately prepare for things such as the stress of travel, sleep impairment, poor nutrition and/or hydration and injury. 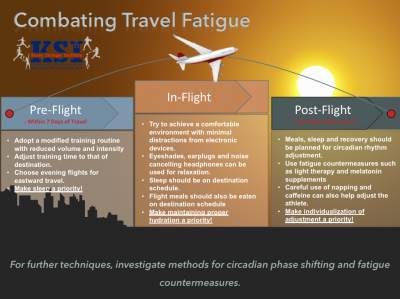 Implementing fatigue countermeasures begins first with recognition of outside stressors and then adherence to a few best-practice techniques.Below are a few visuals to help us become aware of undesired stress outside of training and techniques in combating travel fatigue and promotion of optimal recovery.